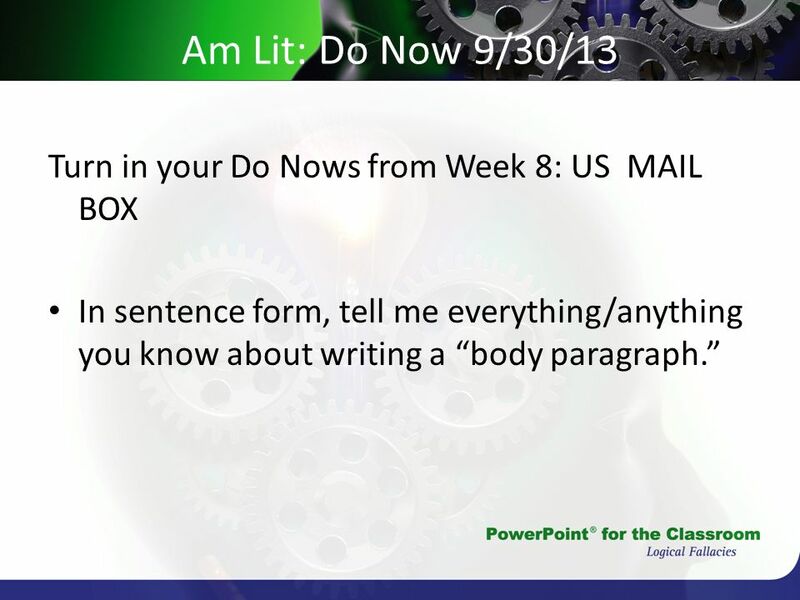 1 American Lit: Week 9 Week’s Agenda: Finalize body paragraphs today. 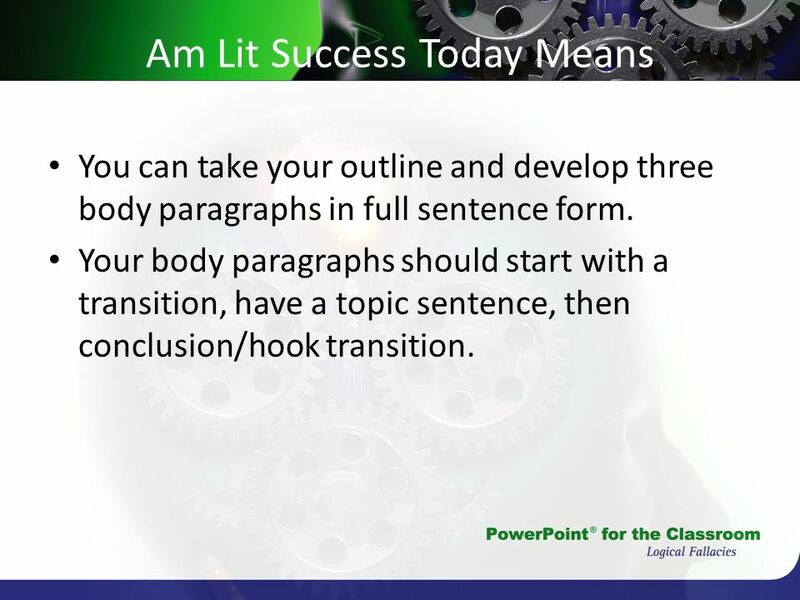 You can take your outline and develop three body paragraphs in full sentence form. Your body paragraphs should start with a transition, have a topic sentence, then conclusion/hook transition. 4 Can you find the “Hook transition”? 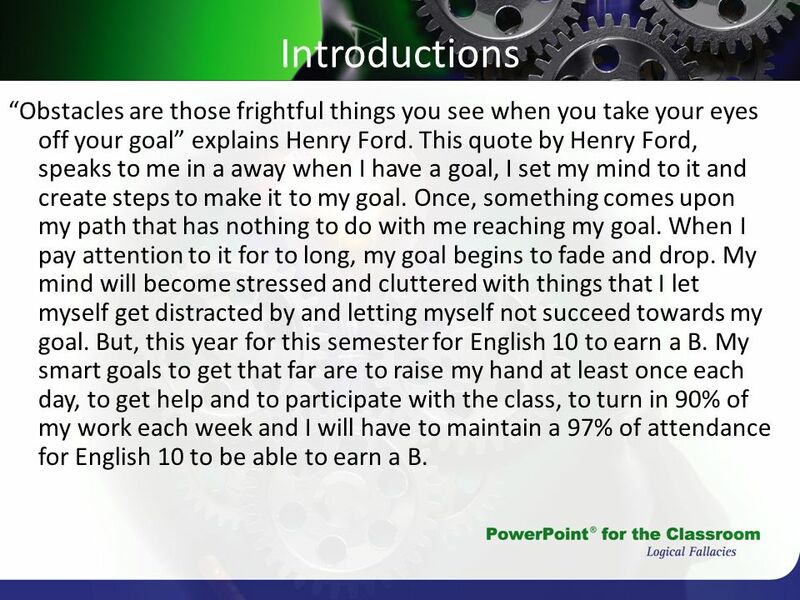 My second goal for this class, is to pay attention and turn in 90% of my work by the end of the week when it is due. To be able to get my work done and to turn it in, I should really pay attention to the teacher and focus on work first and not on my friends. Maybe, once I have my work done and turned in if the teacher allows talking but quietly with classmates, then I should wait until my friends are done with their work, so I don’t distract them while talking. I shouldn’t allow myself to get off guard and off track by socializing with my friends. 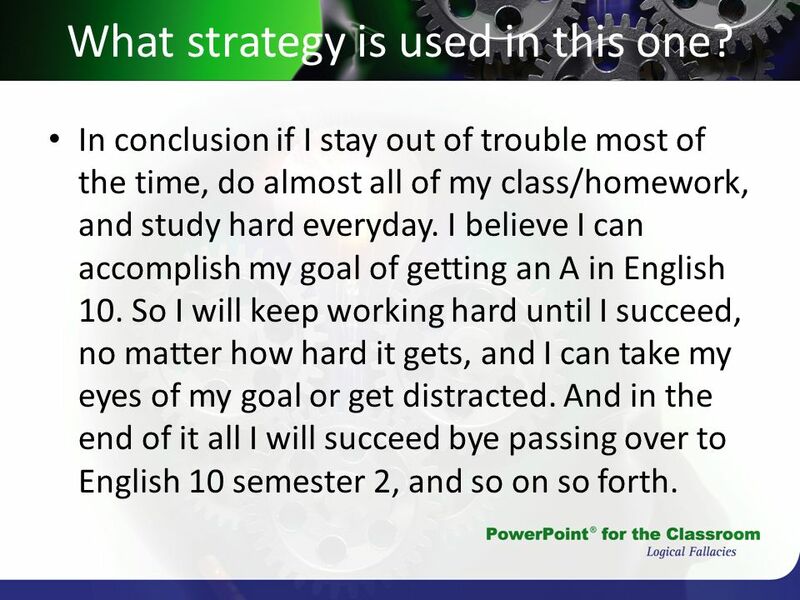 To succeed in English class is to really work hard, pay attention and to put in the effort. 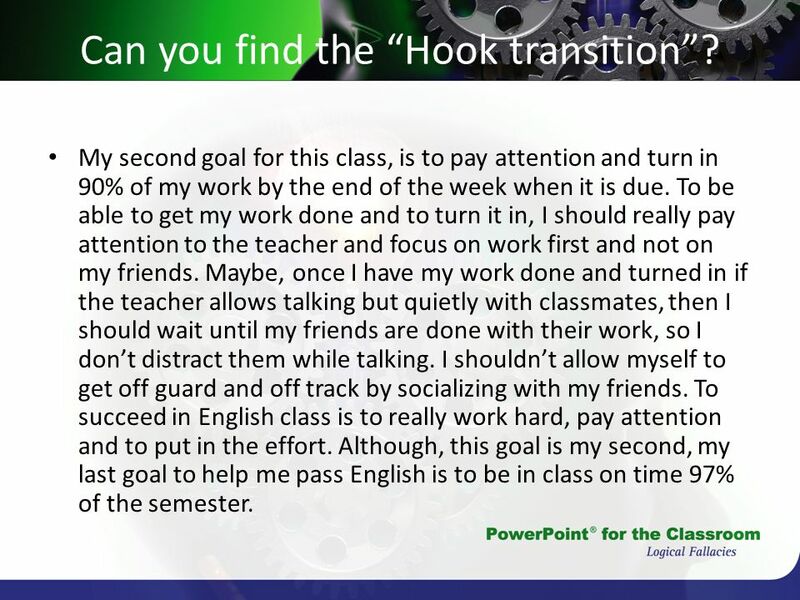 Although, this goal is my second, my last goal to help me pass English is to be in class on time 97% of the semester. 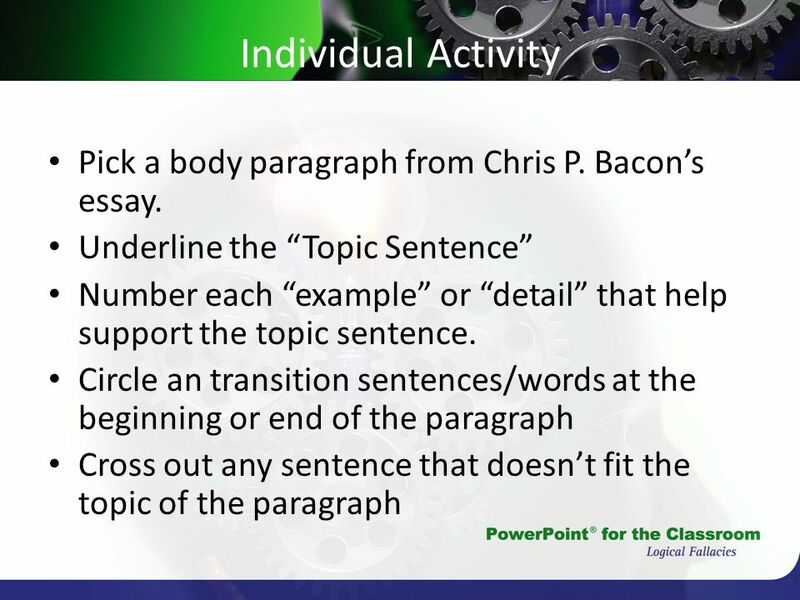 5 Individual Activity Pick a body paragraph from Chris P. Bacon’s essay. 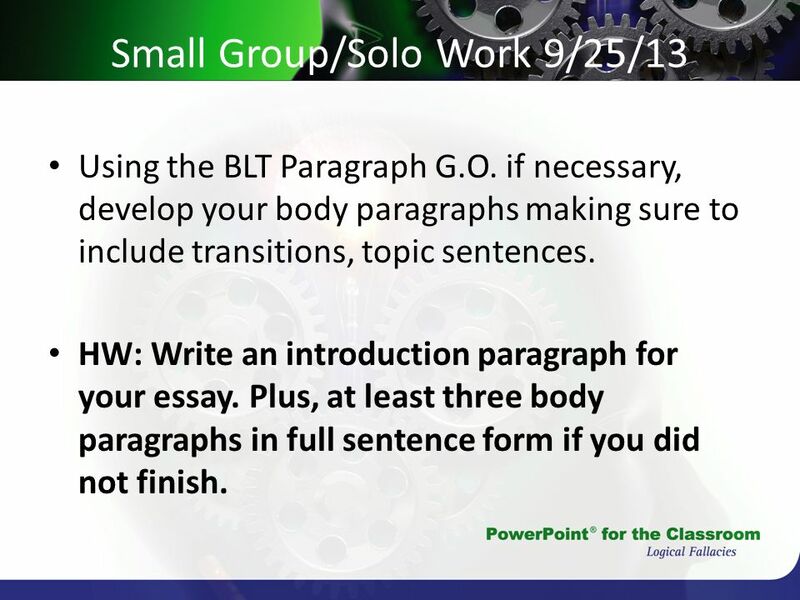 Using the BLT Paragraph G.O. 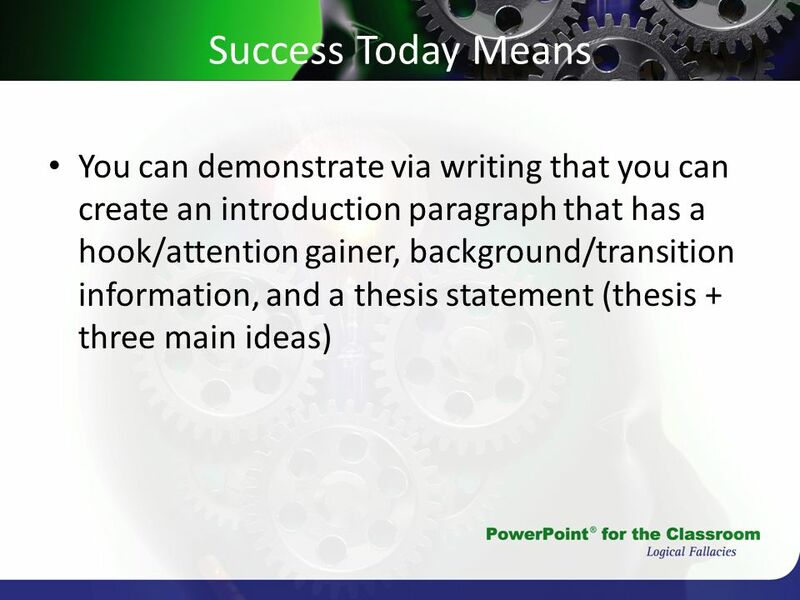 if necessary, develop your body paragraphs making sure to include transitions, topic sentences. 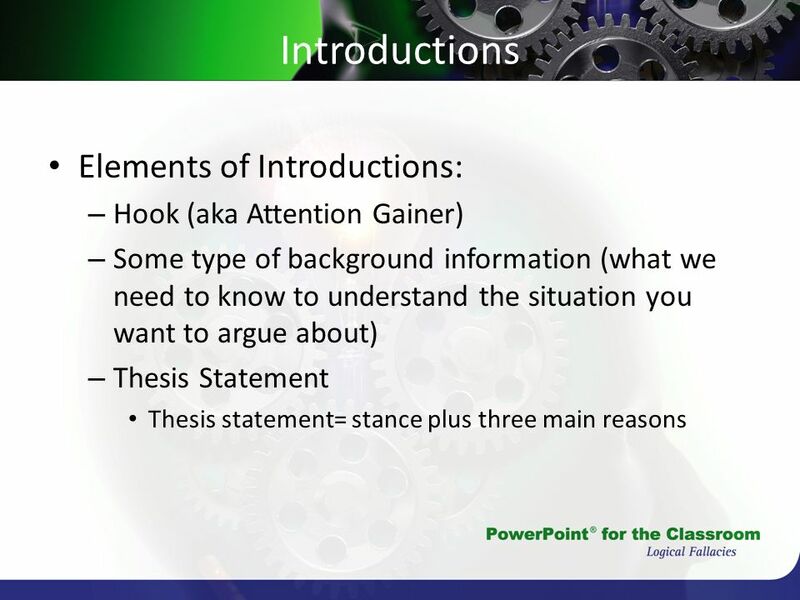 HW: Write an introduction paragraph for your essay. Plus, at least three body paragraphs in full sentence form if you did not finish. 7 Am. Lit. 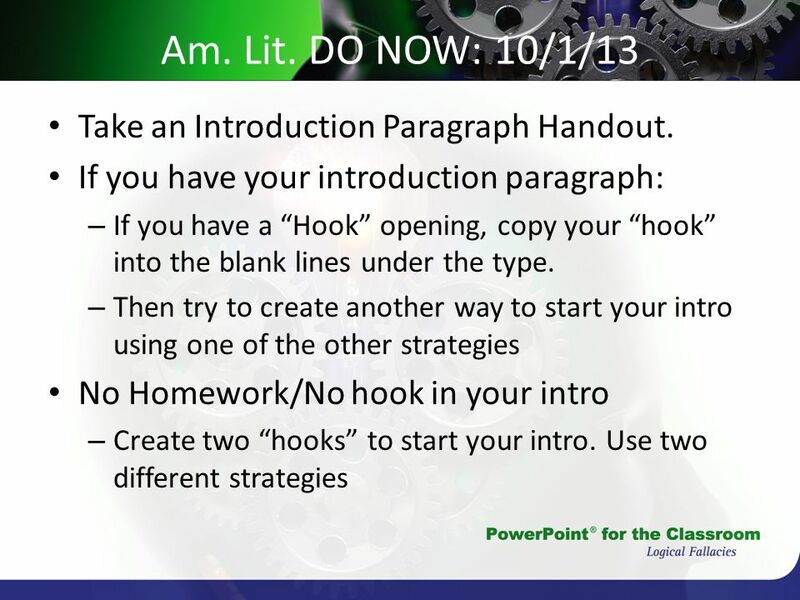 DO NOW: 10/1/13 Take an Introduction Paragraph Handout. 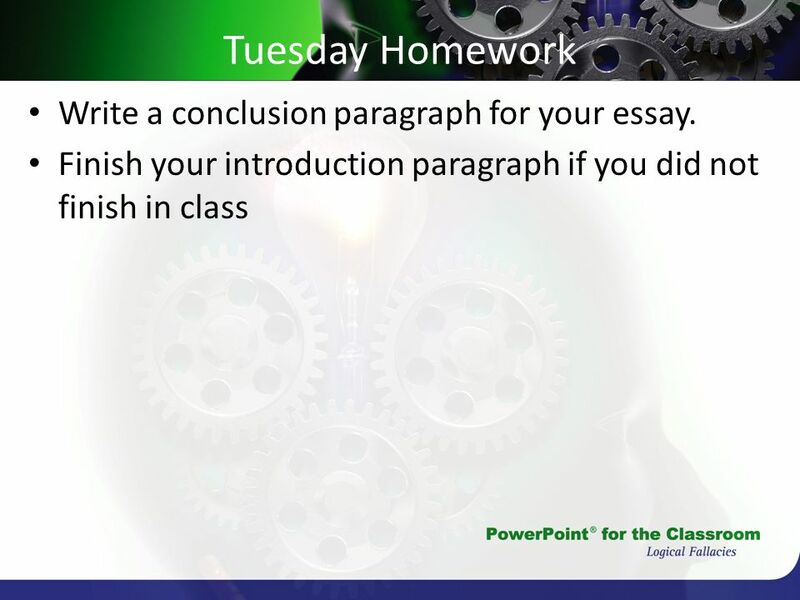 11 Tuesday Homework Write a conclusion paragraph for your essay. 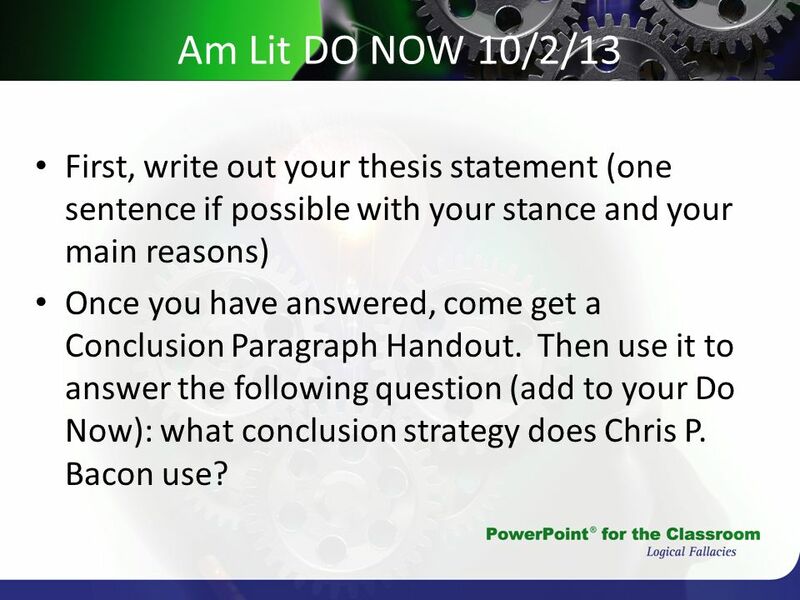 12 Am Lit DO NOW 10/2/13 First, write out your thesis statement (one sentence if possible with your stance and your main reasons) Once you have answered, come get a Conclusion Paragraph Handout. 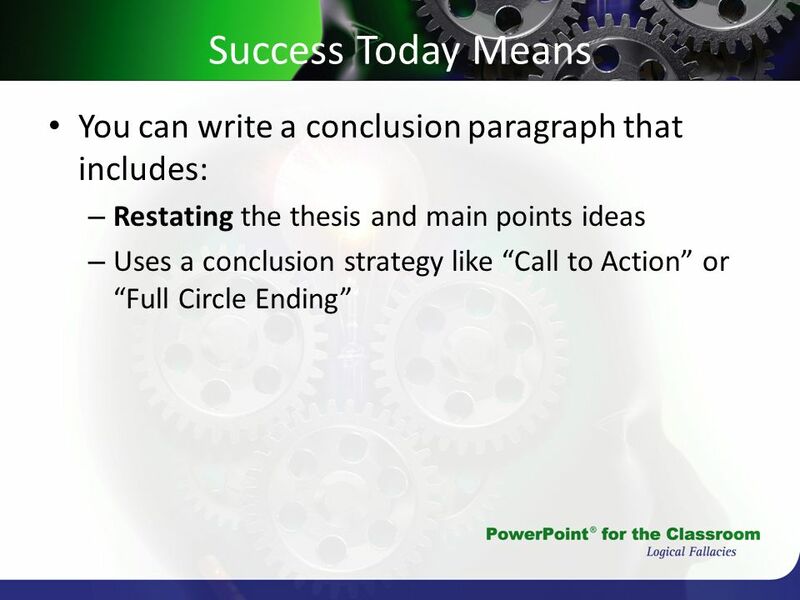 Then use it to answer the following question (add to your Do Now): what conclusion strategy does Chris P. Bacon use? 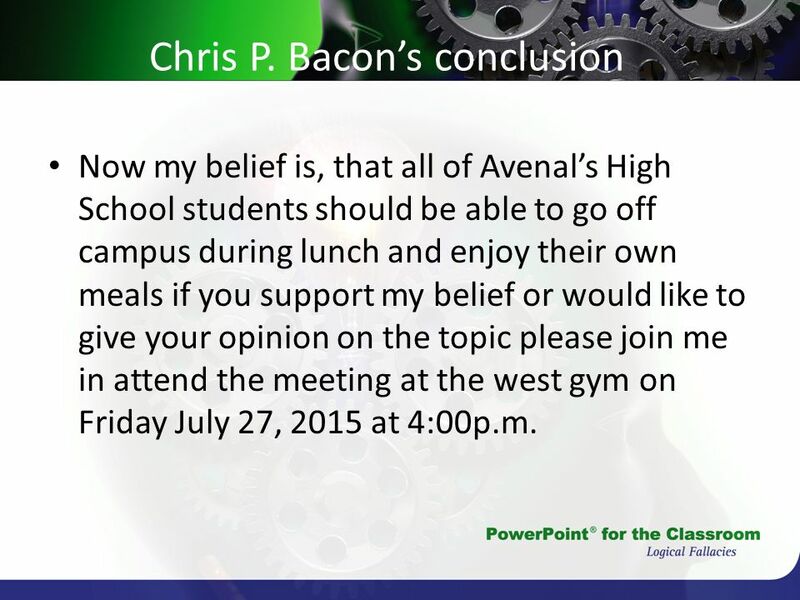 Now my belief is, that all of Avenal’s High School students should be able to go off campus during lunch and enjoy their own meals if you support my belief or would like to give your opinion on the topic please join me in attend the meeting at the west gym on Friday July 27, 2015 at 4:00p.m. 16 What strategy is used in this one? In conclusion if I stay out of trouble most of the time, do almost all of my class/homework, and study hard everyday. 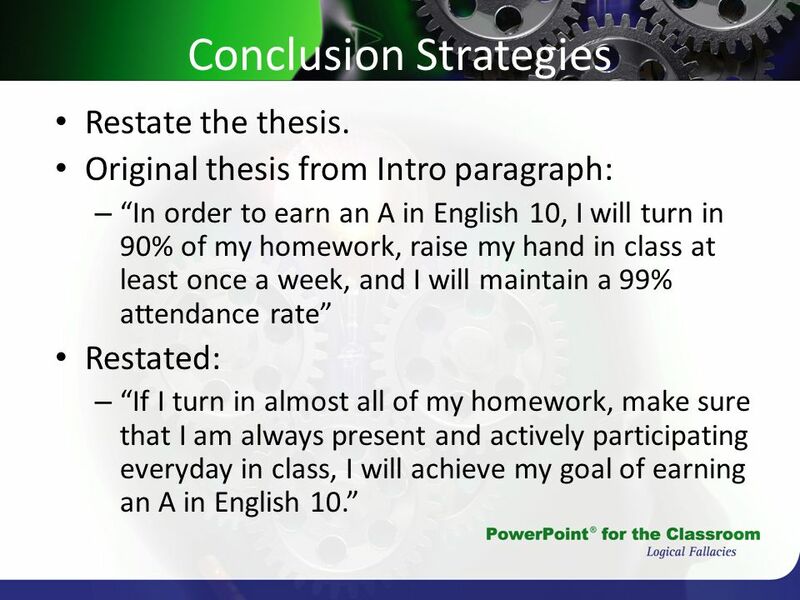 I believe I can accomplish my goal of getting an A in English 10. So I will keep working hard until I succeed, no matter how hard it gets, and I can take my eyes of my goal or get distracted. And in the end of it all I will succeed bye passing over to English 10 semester 2, and so on so forth. 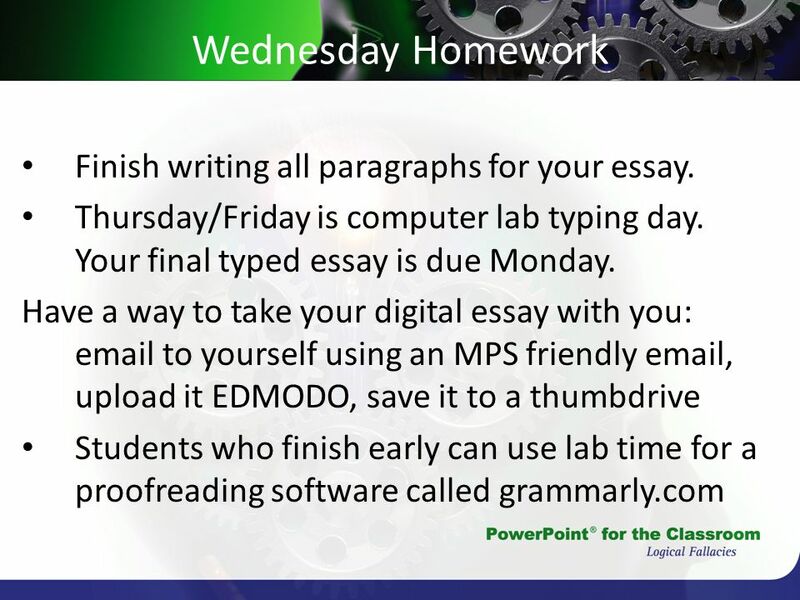 18 Wednesday Homework Finish writing all paragraphs for your essay. 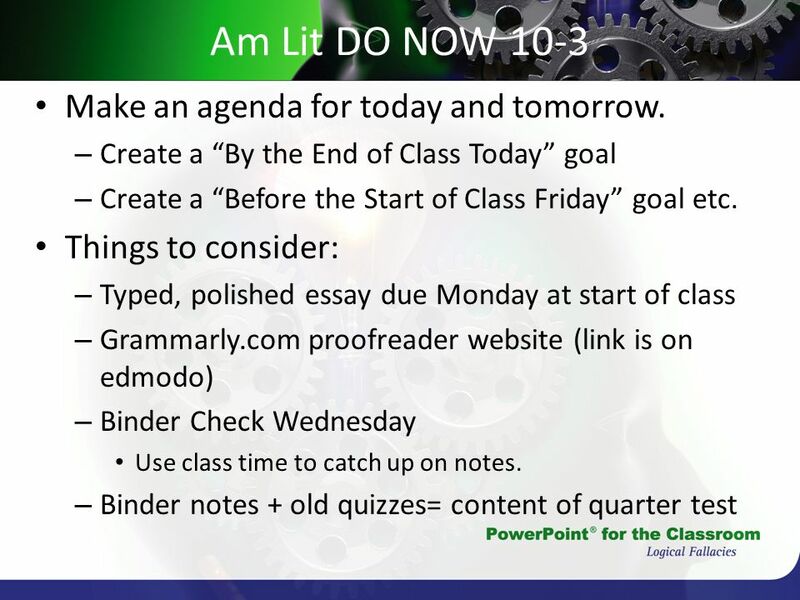 19 Am Lit DO NOW 10-3 Make an agenda for today and tomorrow. Did you achieve your goal? Why or why not? What is your goal for today? Backup plan if you do not achieve your goal? What times this weekend would you be able to work on finishing your essay? 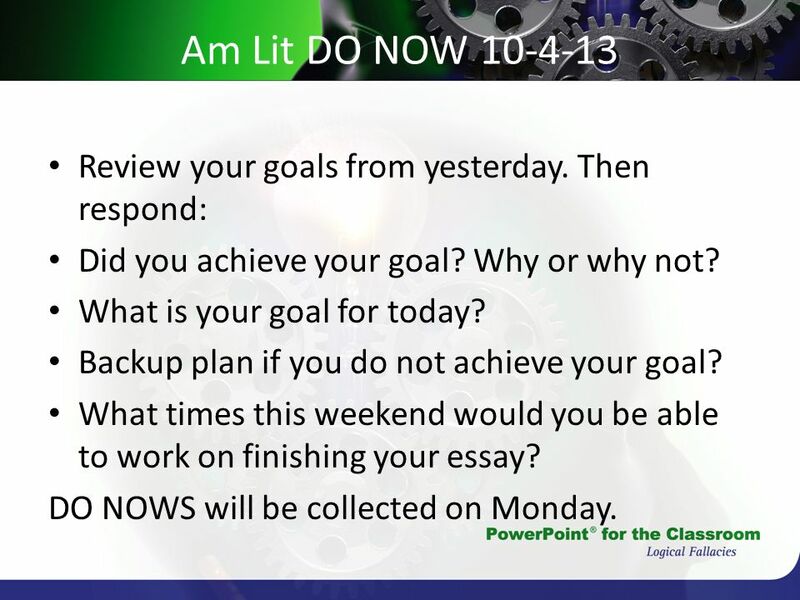 DO NOWS will be collected on Monday. 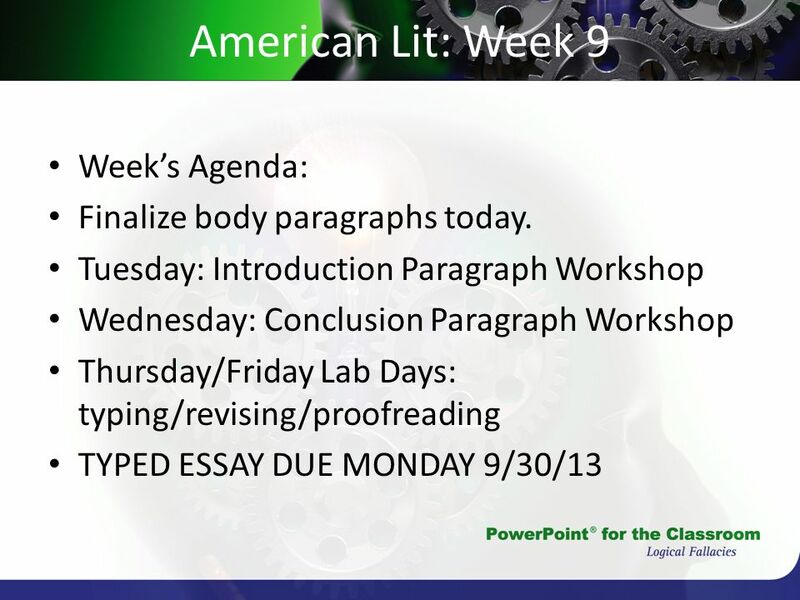 Download ppt "American Lit: Week 9 Week’s Agenda: Finalize body paragraphs today." Week One A New Day. Week 5 Monday February 11th. U.S. HISTORY Ms. Sexton. END OF COURSE ASSESSMENT EOC End of the year test Given during the last two weeks of school Counts for 20% of your final. 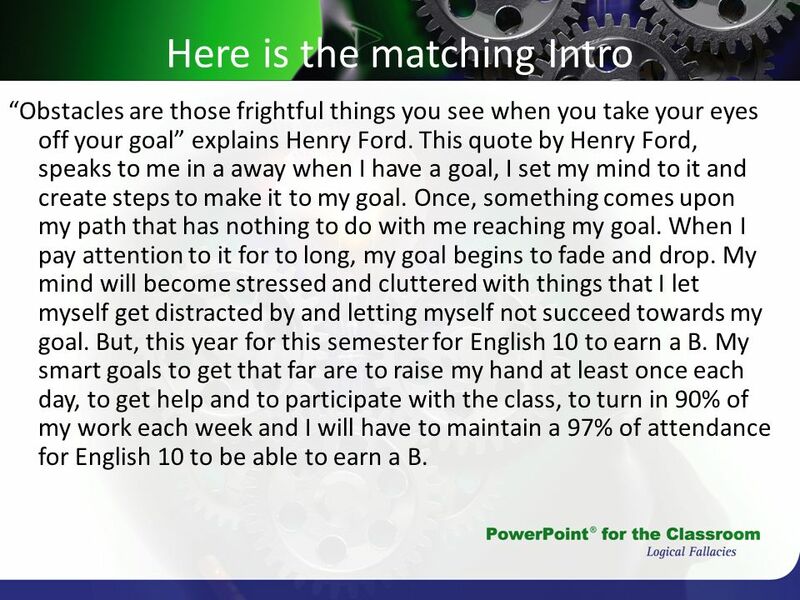 SOME THOUGHTS ON WAYS TO MAKE WRITING EASIER English 1101 Karen Roop. Writing an Essay Career Fair Paper. Essay Persuasive/Argument. AIMS NEXT WEEK   Students report to their 4 th period class.   Testing is from 9:07-11:35 – The rest of the day will be. + 12 th Grade 11 Agenda & Obj. 11/11-11/15 Monday: Movie Tuesday: Review Wednesday: Unit Test. HOPE YOU’RE READY TO EDIT! “The simpler you say it, the more eloquent it is.” ~ August Wilson 3/10/14 Please take out your rough draft with word count.